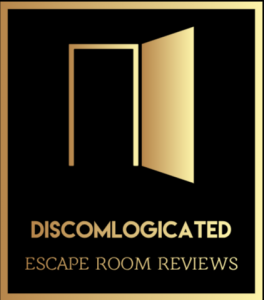 Alas, a friend decided it would be the perfect venue for his birthday (a combination of great reviews and 4 copies of the same room so we could go head to head). Therefore I was forced to face my fears if I didn’t want to lose those valuable pride points. Before wading it, I contacted someone who had done the room before who warned me of the bits to prepare myself for, and apparently the company itself also has a ‘joker card’, and will tell my cowardly brethren these points to brace for, and tone down the scares. Before I go into the review, I feel like I need to emphasise that this isn’t a scary room, and there are minimal scares. We had a good laugh after, and even knowing they were coming they still got me! I probably would’ve enjoyed the room more had I not known (as I was on edge for certain parts), but think this was a great room for both the adrenaline junkies and horror film phobics alike. The entrance to the location has a definite mystery feel to it, and the waiting room was pretty nice too. The brief is that a video/photo editor was locked in the edit room overnight, to edit the studio’s new film, but had disappeared in the morning. We were told the rooms would be mostly the same, but slightly different. I thought this was quite a nice touch – we had the same number and type of puzzles, but the set itself differed, so puzzles were presented in different ways, which was a nice touch. You are locked into what appears to be a normal office, but there are some really nice touches here. As you work your way through the room the set maintains the high standard, and the key indicator of this was that we knew if something didn’t work, it was down to us rather than the room not working. The premise of the game is to discover what happened to this missing editor, and I think the room does a pretty good job at pulling you into the story. There is a common theme with the puzzles as you move through, tying everything together. This was actually hinted at during the brief, but you only pick up on it once you’re in the room. The room was multi-linear, and had enough going on for a team of 4 to pair off and not be too bored. Towards the end it started getting a little one-dimensional, but as the puzzles and set were so interesting I didn’t mind too much. Difficulty wise it was definitely engaging without being frustrating – we finished at 52 mins, and for a quite experienced team it’s rare for us to get that heart pounding feeling! There were some interesting mechanics we hadn’t encountered before, as well as some old favourites. The hint system was on a screen (yay! ), and I loved how our GM wasn’t afraid of nudging us where necessary, even just to confirm we were on the right lines. I definitely would recommend against this room if you have any heart issues or are quite sensitive. In particular, do not do this room if you have a panic or anxiety disorder, or are claustrophobic as you will need to be in a small dark space for a very little while. There are stairs into the venue, and I’m not sure if they have an alternative route. The room itself would also be too small/narrow in places for a wheelchair user to comfortable navigate. You will also need to reach above head-height for a puzzle. There is somewhere to sit down initially, but not further into the room. The room is well lit for the most part, bar one point. However, there are lots of screens, so you may want to discuss this with the room prior to going if you have light sensitivity issues. One of the things that made this room stand out to me was the excellent customer service. We had two teams, and there were 2 other teams there who we didn’t know. The GMs were excellent at getting everyone ready and taking them to their rooms seamlessly and efficiently. When it was just our two teams left our GM (Hanna) delivered the safety brief, and our friends’ GM (Dan) delivered the story brief – both high quality and excellent briefs. As mentioned, Hanna delivered us the perfect clues at the perfect times – mostly nudges, which were cryptic enough to be seen as helping rather than hand holding. However, what really stood out was that after coming out first, we were invited to watch our friends whilst they were still doing their room, and even interact. I don’t want to give too much away here, but suffice to say it was a really nice touch, which topped off our experience much more than if we had just sat in the waiting room for 10 minutes. Hanna was really effusive about our game, and I enjoyed talking to her afterwards. I am actually quite grateful to my friend for booking this room, despite my worries, as I wouldn’t have done this otherwise. It was honestly a fantastic room, and a super fun experience!